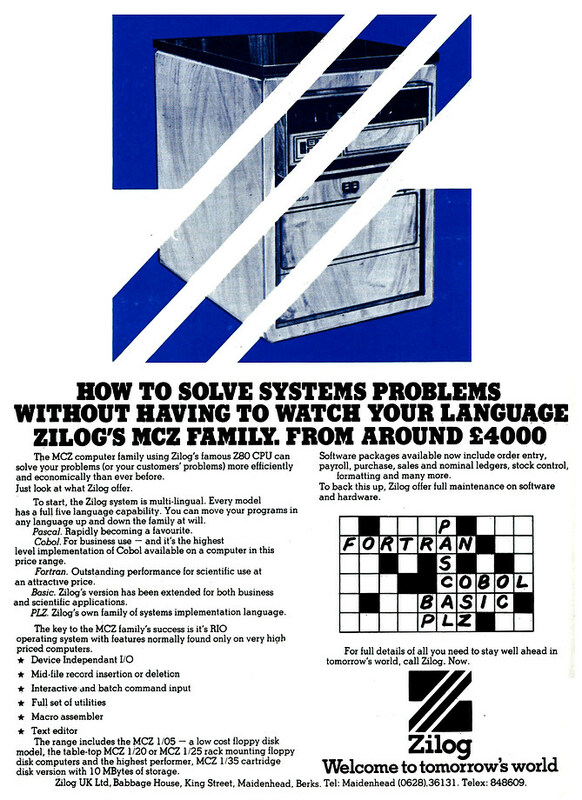 A rare advert from Zilog for its MCZ range of micros - everything from an entry-level floppy-disk-based model up to the MCZ 1/35 rack-mount machine with 10MB storage. The entry-level "low cost" machine retailed at around £4,000, or in the region of £21,800 in 2019. It was yet another Z80 micro, which was fair enough as Zilog was the manufacture of that chip, which was originally released in 1976 as a binary-compatible replacement for Intel's 8080. This meant most significantly that dominant business operating-system-of-choice of the day - CP/M - would work without alteration, making Z80-based machines popuplar in the small-business world. Zilog formed when three of Intel's 8080 designers left the company in 1974, making Zilog one of the "Fairchildren" - companies that derived from Fairchild Semiconductor, which itself was formed by the defection of the "traitorous eight" from Shockley Semiconductor - a group which included Robert Noyce and Gordon Moore, the founders of Intel. Backed by funds from oil behemoth Exxon, it wasn't until around 1980 that the company actually made any money, even though Zilogs's Z80 - along with MOS Technology's 6502 - accounted for much of the microcomputer market for the decade between 1975 and 1985. The name Zilog apparently derived from "Z", meaning the last word (well, letter at least), "I" meaning "integrated" and Log for Logic - hence the "last word in integrated logic". As well as that, it was unusual in that the company had its own comic-strip hero - Captain Zilog.